ML-T Analytical is a clever balance featuring ergonomic design, multiple built-in applications, battery operation for full mobility, and of course good weighing performance and robustness. All of this on the smallest footprint of its class! With ever-increasing demands, such as those from ISO, GLP and GMP, you need a balance which can support your everyday tasks and keep you on the right track. Discover the new ML-T balance With a high-performance weighing cell, integrated security features and user guidance, ML-T analytical balances give you confidence in your results. Intuitive touch operation The comfortable 4.5" color TFT touchscreen is operable through cotton, silicone and latex gloves. An intuitive user interface and large digits bring comfort to your daily tasks. Built-in function simplifies balance leveling The built-in LevelControl function issues a warning when the balance is not level and provides onscreen guidance to help you level the balance correctly within seconds. Proven weighing cell delivers reliable results Our renowned MonoBloc weighing cell, with FACT automatic internal adjustment, delivers consistently reliable results. Built-in overload protection ensures a long balance lifetime. MinWeigh function ensures process tolerances The weight value remains red until the net sample is above the pre-programmed minimum value. 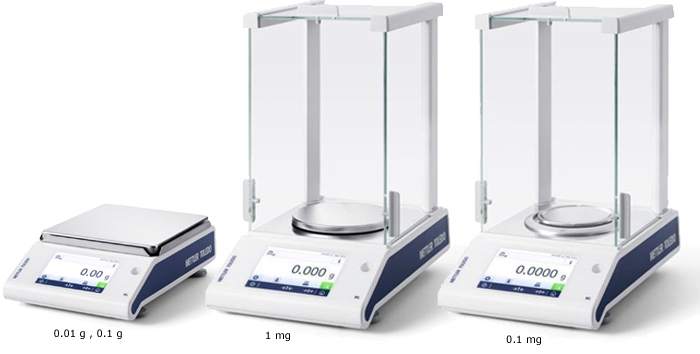 A user-defined minimum weight can also be programmed into the ML-T analytical balances to provide an additional safety factor. Quick and easy cleaning The QuickLock draft shield dismantles in seconds without any tools and all parts are dishwasher proof. Surfaces are smooth and rounded to make cleaning easy and safe. Get connected for easy data handling Unlimited connectivity thanks to USB Host, USB Device, RS232 and optional Bluetooth. The built-in PC Direct function allows for easy data transfer without additional PC software.